The innovative features are flawed to one degree or another, casting a dark shadow on a phone that otherwise does have a lot of offer. I never thought I’d write this about any phone, but the LG G5 just feels a bit desperate. It feels rushed. It feels like LG’s designers were locked in a room, working on what could be a very good phone, and then someone bolted out the door Leeroy Jenkins-style, and unleashed the G5 on the world before the concept was fully realized. Check it: In the transition from last year’s G4 to this year’s G5, LG moved to a nearly all-metal design, added a fingerprint sensor, and overhauled its battery swapping system. The company also added an always-on display, and a second rear-facing camera for taking wider-angle shots. On face value, these all sound like interesting, welcome additions. But dig a bit deeper, and you’ll find some of the changes are quite incremental, and not always well-executed. And then we have LG’s new Friends accessories: two hardware modules that snap directly into the G5’s body, giving the phone an upgradability story that’s similar to what Google imagines for Project Ara. The Friends are LG’s bid to show that the company is still thinking big in the mobile space, and pushing the edge of what a smartphone can be. 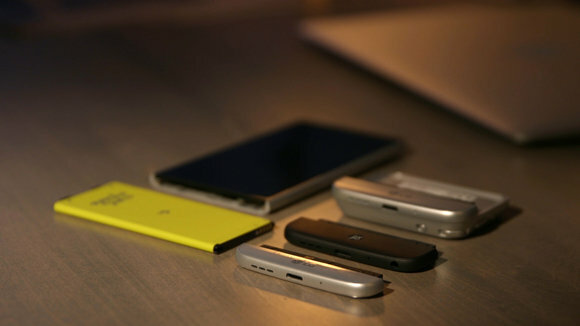 The LG G5’s removable battery, along with the phone’s stock chin (bottom), Hi-Fi Plus (middle) and Cam Plus (top). These are admirable goals. Just one problem, though: The two Friends I tested—the Hi-Fi Plus digital audio converter and Cam Plus camera controller—just aren’t very good. They drag down the G5’s score, which is already imperiled by poor execution and dubious decisions. It’s a shame, because the $1,099 G5 does improve upon last year’s G4 in a few areas. But for this review we have to look at the entire G5 concept—the full experience, and what it says about LG’s smartphone development. For two years running, we’ve had to diss LG for shipping its premium flagship phones with plastic shells. Apple has had a metal unibody design since the iPhone 5, and Samsung made the jump to full metal cladding for its Galaxy flagship two generations ago. Of course, LG has always had a defensible excuse: Its earlier flagship phones required a plastic back panel to facilitate the company’s battery-swapping scheme. The opportunity to swap a depleted battery for a fully charged battery has been a unique selling proposition for LG, but owners have had to accept the compromise of a downmarket design—along with the possibility that their back panels will fly away into oblivion when they drop their phones. Indeed, those back panels were difficult to pry off for battery swaps, but eager to pop off during spills. Here’s a good look at the G5’s dual cameras and rather tiny fingerprint sensor. Also note the almost glowing luster of the case edge. In the new G5, LG finally improves its system for battery swaps, and introduces a mostly all-metal body in the process. 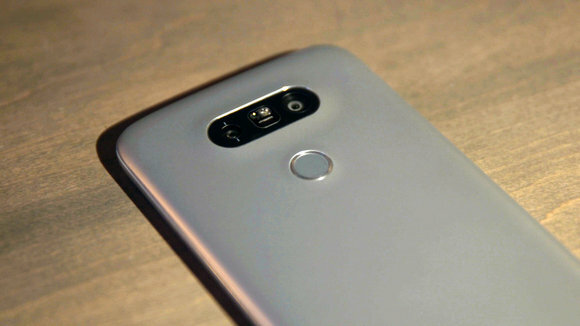 As LG explains, the phone’s body is made from “microdized” aluminum—a die-cast aluminum shell covered in primer, which is then covered by a metal pigment. Our pre-production unit (which I cover extensively here) came in pink, and has a bit more glowing luster than the silver version I tested for this final review. But both the pink and silver bodies look and feel more high-end than the plastic-backed G4 I reviewed in 2015. Just be aware that the microdized surface will scuff and and scratch under abuse. I would have preferred a more durable finish, and maybe that’s something LG can improve in next year’s G6.